Shortly after graduating high school, Jason Hemmens moved to Louisiana, enrolled in the Jazz Studies Program at the University of New Orleans, and began to develop his skills as a multi- instrumentalist / vocalist, studying with Jazz legends HAROLD BATTISTE and Grammy award winner TERRANCE BLANCHARD during the day and performing at clubs on Bourbon Street through the night. In 2010 Jason released his first album, which includes performances by Grammy Award winning violinist CHARLIE BISHARAT, and drummer RONALD BRUNER Jr., whose superb performances were captured by renowned mix engineer TOM WEIR. Shortly after, he followed this recording effort with his first music video, which received an impressive 16,000 views in its first six months. Jason, a true multi-instrumentalist, who is, as well as being an accomplished vocalist, fluent on Saxophone, Harmonica, Piano and Bass, has performed with the legendary STEVIE WONDER as well as other celebrities as diverse as TEVIN CAMPBELL, DIZZY REED and GILBY CLARKE of GUNS N’ ROSES, and RIKKI ROCKET of POISON, just to name a few. He has also performed at the New Orleans Jazz and Heritage Festival and the Java Jazz Festival with Legendary Indonesian Jazz Artist Dwiki Dharmawan. In addition, Jason has also received the New Orleans’ Prestigious Best of the Beat, OffBeat Award. His newest single, “Try Not To Miss You,” is a textbook example of all of his skills combining into one masterful pop tune that combines infectious melody, stellar musicianship, and gut wrenchingly honest lyrics. The message of the song touches the listener right in the heart. Anyone who has ever been in the midst of a complicated relationship can relate to the difficulties involved and the joy involved with giving a big old goodbye! For the new video Jason has teamed up with director Jared Sagal to put a more lighthearted spin on the subject matter. The video starts out with Jason getting his band geared up to hit the stage. Upon noticing the his gal Brittani and bandmate Jimmy were missing he quickly finds them getting behind closed doors. We get the sense that this isn’t the first time this has happened. Being the bigger man, Jason walks away, resigning himself to the fact it’s all over for him. Not soon after Jason is abducted and held captive in the back of a mysterious white van with another hooded captive. As the interrogation plays out we flash back to happier times between Jason and Brittani, as well as stylish live performance shots. Determined to find out the truth, Jason pulls the hood of his co-captive and quickly realizes it’s none other than Brittani herself who set the whole thing up to try to win him back. We won’t give away the ending, but stick around til the end, it’s fantastic! Love works in strange ways, doesn’t it? 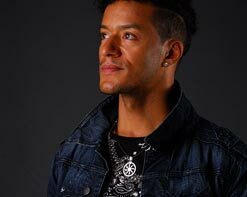 We are very pleased to be working with such a standout talent like Jason Hemmens and are excited to bring you his new video “Try Not To Miss You.” For more information on Jason Hemmens please contact the HIP Video Promo crew at (732)-613-1779 or email us at info@HIPVideoPromo.com for more info.. You can also visit www.Facebook.com/JasonHemmensMusicPage.